15 steps to get the most from a small home. Small log homes remain popular for two reasons: They’re affordable and provide close-quarter comfort. Squeezing everything into a cozy design can be challenging, however. When planning your small home, it helps to have a couple of tricks up your sleeve. 1. Borrow space within an open floor plan. The fewer walls, the better. Open spaces are more comfortable and allow for versatility. Open floor plans also make your spaces work twice as hard. 2. Keep it simple. A square or rectangular floor plan not only saves money, but also eliminates tiny spaces where log work is awkward and difficult to piece together. It also eases the relationship between the builder and homeowner since a simple plan is easier to construct. 3. Be creative about storage. Find ways to use every square foot of space. A small home can never have too much storage. Build at least one good-sized closet in every room, then find clever ways to make use of other storage spaces. 4. Expand upward, not outward. Whether limited by budget or the size of your site, adding floor levels is less expensive and more effective than expanding the footprint. Cathedral ceilings are nice, but they eat up valuable square footage where an upper level or loft could be built. Raising your ceilings a foot can create a similar effect without wasting any second-floor space. Enclose the space under stairs for storage. 5. Provide perceived space. Contrary to the previous point, sometimes implied space is more valuable than actual space. You may decide that the open feel of a cathedral ceiling is well worth the space lost by going without the space above it. 6. Remove extraneous rooms. Do a thorough self-analysis before designing your home. By cutting space from bedrooms and bathrooms, you can add crucial square footage to other rooms. Keep living spaces and common areas as big as possible. 7. Eliminate hallways. They take up space for little benefit. Removing a hall that separates the kitchen and dining rooms results in more usable space, and you can still get to the living room just as easily. 8. Use outdoor spaces to expand living space. Besides bringing you closer to the outdoors, porches and decks provide overflow space for homeowners and guests. Dormers, bump-outs, breakfast nooks with bay windows and gabled entry elements also expand living space. Clerestory windows and lofts with views bring in natural light, further blurring the line between inside and outside spaces. 9. Use thoughtful decor. Finish your rooms in ways that maximize the perceived space. A monotonous space without depth and shadow feels lifeless and smaller than it actually is. Adding depth and accents through lighting and trim details makes spaces feel larger and more alive. 10. Provide a focal point. If you have one focal point per room (fireplace, stairs, wall of windows, etc.) your rooms will feel comfortable and less cluttered — an important consideration when dealing with small spaces. 11. Incorporate space-conscious stair and fireplace design. Straight stairs require less room than U-shape or right-angle stairs. Avoid curved stairs. Spiral stairs and ladders are good space savers but aren’t very functional, especially when transporting bulky objects. Choose a fireplace that doesn’t eat up space, then place it where it maximizes square footage. 12. Keep small kitchens functional. A 30-inch-wide refrigerator, conventional four-burner range and a pair of sinks make an adequate kitchen. Allow 18 to 24 inches of counter space on each side of the stove and at least 2 feet on one side of the sink. Use base cabinets below and shelves or upper cabinets above for efficient storage. 13. Don’t sacrifice quality. Smaller ranges, refrigerators and stacking washer-dryers are available in most trusted name brands. 14. Keep logs to scale. The size of logs is very important. Think proportion. Huge logs can make a small home feel even smaller. Use logs that complement the size of your home’s rooms. Visit already built log homes to see how log size affects the look and perceived size of each. 15. Finish the basement. A finished basement adds inexpensive yet functional space. This lower-level space works well for secondary bedrooms, bathrooms, family rooms and rec rooms. For upper level storage, build a knee wall directly under the eaves. 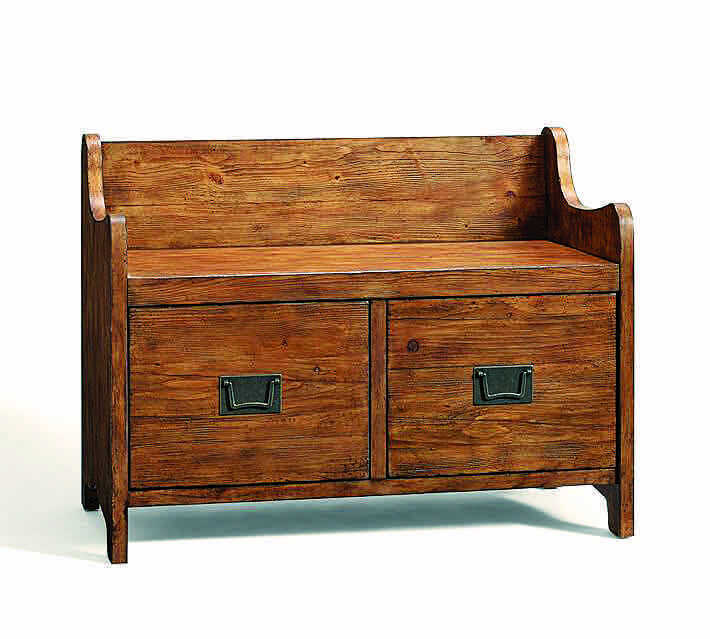 Instead of a table at the entry, place a cabinet with enclosed storage underneath for boots and shoes, like this Wade Bench from PotteryBarn.com. If you prefer to see logs all around your kitchen, a good builder ought to be able to attach your cabinets directly to the log walls without problems. Many other options for concealing water lines and vent pipes are available. Raise your bed 5 to 10 inches to gain extra storage space beneath it.